This course is designed to prepare the certified dental assistant to properly apply dental sealants in the dental practice. 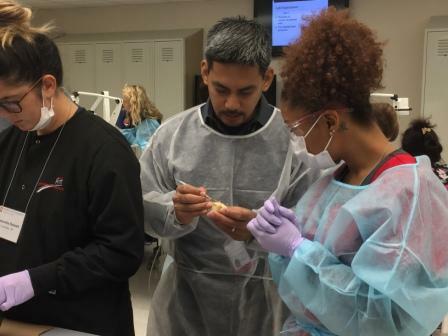 Participants should bring a sample of the sealant material used in your office and bring as many extracted teeth as you can in a sterilization pouch. 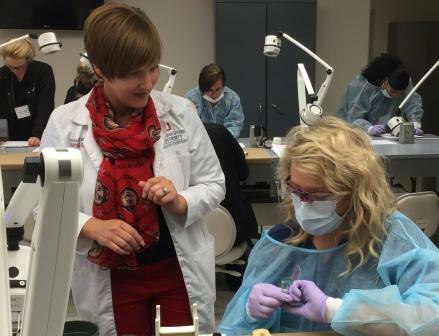 This board approved lecture/hands-on course satisfies the 8 hour CE requirement from the Ohio State Dental Board for CDA's to perform this function. Requirements Below: Due by Monday, March 11, 2019.
each of the vaccinations listed to the left. Please fax (614-688-3188) or email (osucde@osu.edu) checklist and supporting documentation by Monday, March 11, 2019.
a copy of the quiz scores by Monday, March 11, 2019. Please fax (614-688-3188) or email (osucde@osu.edu) by Monday, March 11, 2019. During the clinical portion of the course, students will be both operator and patient as you will practice the techniques on a classmate. "Very good and informative course. Great instructor!" "Clinical was fun. I love the hands on..."
"Great instructor. Knowledgeable and down to earth." "The instructor was great. I really enjoyed the lecture and I learned a lot."